Originally inhabited by Alutiiq natives for over 7,000 years, the city was settled in the 18th century by the subjects of the Russian crown and became the capital of Russian Alaska. Harvesting of the area's sea otter pelts led to the near extinction of the animal in the following century and led to wars with and enslavement of the natives for over 150 years. The Kodiak Archipelago has been home to the Alutiiq for over 7,000 years. In their language, kadiak means "island". In 1763, the Russian explorer Stephan Glotov discovered the island, calling it Kad’yak (Кадьяк). 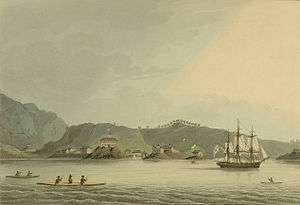 He was followed by the British captain James Cook fifteen years later, who first recorded "Kodiak" in his journals in 1778. A warehouse was built in what became one of the key posts of the Shelikhov-Golikov Company, a precursor of the Russian-American Company and a center for harvesting the area's vast population of sea otters for their prized pelts. The warehouse still stands as the Baranov Museum. Because the First Native cultures revered this animal and would never harm it, the Russians had wars with and enslaved the Aleuts occurred during this era. In March 1964, a tectonic tsunami struck the city during the 1964 Alaska earthquake with 30-foot (9.1 m) waves that killed 15 people and caused $11 million in damages. Some areas near Kodiak were permanently raised by 30 feet (9.1 m). It wiped out the neighboring Native villages of Old Harbor and Kaguyak. The Standard Oil Company, the Alaskan King Crab Company, and much of the fishing fleet were also destroyed. The community of Kodiak lies within the subpolar oceanic climate zone (Köppen Cfc), marked by relatively long and cold winters and mild summers. Precipitation is heavy year-round, though markedly less in the summer months. In the city the population is spread out with 29.1% under the age of 18, 8.7% from 18 to 24, 32.2% from 25 to 44, 23.1% from 45 to 64, and 6.8% who are 65 years of age or older. The median age is 34 years. For every 100 females there are 114.3 males. For every 100 females age 18 and over, there are 120.6 males. Kodiak is an important environmental asset which affects the fishing industry, particularly salmon fishing. Its wild game is coveted by hunters worldwide for the Kodiak bear and other game animals; there are strict laws governing fishing and hunting activities as well as hiking near spawning streams. Both the Department and the city maintain websites and publish brochures to help communicate these strictly enforced laws. All of the city's hotels and businesses have these materials in prominent areas for guests, and licenses can be purchases in the city's main sporting goods store and online. The Kodiak Island Borough School District operates four elementary schools, one middle school and one high school within city limits. The city is home to Kodiak College, a satellite campus of the University of Alaska Anchorage. Within the public school district, there are eight rural schools. Kodiak Bears sports have a long tradition dating back into the 1960s, when Joe Floyd was successful in coordinating high school athletics as well as intramural sports. He was a coach for several sports, as well as an athletic director for several years. There have been a total of nine ASAA affiliated State Championships in the variety of 2 Boys Track, 1 Girls X-Country, 1 Girls Basketball, 1 Boys Basketball, 1 Boys Baseball, and most recently, a string of three consecutive titles in Boys Cross Country (2006–08). The boys cross country team was led by 3-time state individual champion Trevor Dunbar, who now runs for the University of Oregon. Kristy Klinnert was the Alaska State Cross-Country Running Champion from 1983-1987. She set and still holds the State record in the 3200. For two years in a row, she won the State Championship in the mile and 3200. In 1986, Kristi was named the Alaska Sports Person of the Year. 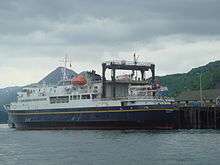 The ferryboat M/V Tustamena is part of the Alaska Marine Highway. It can carry 210 passengers and serves Kodiak, Homer, Whittier and the Aleutians as far as Dutch Harbor. A Floatplane dropping off guests at a remote wilderness lodge on Raspberry Island (Alaska), part of the Kodiak archipelago. All guests to these lodges begin their journey in the city of Kodiak. Kodiak Airport attracts both local and regional airlines, air taxis, and charter floatplanes and helicopters which provide transportation to residents and tourists on and off the island. The Alaska Marine Highway provides further transportation via two ferries: the M/V Tustumena and M/V Kennicott. These ships can carry a capacity of 211 and 748 passengers, respectively, and include routes between Kodiak, Homer and Whittier, Alaska. The ferry system no longer takes passengers to Seward. Floatplane and bushplane companies regularly take tourists to remote areas and wilderness lodges both on the various islands of the Kodiak Archipelago and the Katmai coast for bear viewing, hunting and hikes. The city business community also has a fleet of privately owned taxis as well as kayaks, mountain bikes and ATVs for rent. 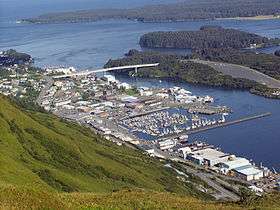 Kodiak and its USCG base have a center role in the movie The Guardian starring Kevin Costner and Ashton Kutcher, some scenes were shot there and in the USCG base. Darby Stanchfield, one of the stars of ABC's hit television series Scandal, was born and raised in Kodiak. In 2012, rapper Pitbull was involved in an advertising campaign with Walmart, in which the Walmart store that gets the most Facebook "likes" from June 18 to July 15, 2012 would have Pitbull visit and put on a show there. An orchestrated internet campaign urged people to vote for the most remote location imaginable, Kodiak, resulting in a sizable lead for that store. Walmart confirmed that Kodiak won. Pitbull visited on July 30 where he received a key to the city from mayor Branson and then made an appearance before a crowd of hundreds at the Coast Guard base. ↑ 1996 Alaska Municipal Officials Directory. Juneau: Alaska Municipal League/Alaska Department of Community and Regional Affairs. January 1996. p. 84. ↑ 2015 Alaska Municipal Officials Directory. Juneau: Alaska Municipal League. 2015. p. 90. ↑ "QuickFacts". United States Census Bureau. Retrieved 2016-03-09. ↑ Haycox, Stephen W. (2002). Alaska: An American Colony. University of Washington Press. p. 82. ISBN 978-0-295-98249-6. ↑ Rosenberg, Bernard (2006). Kodiak Fishing at any Angle. Bernard Rosenberg. pp. 32–40. ISBN 978-0-9777414-0-3. ↑ "Average Weather for Kodiak, AK - Temperature and Precipitation". The Weather Channel. Retrieved 2010-03-08. ↑ "Climate Information for Kodiak - Alaska - Alaska - United States - Climate Zones". Retrieved 2010-05-11. ↑ Moffatt, Riley. Population History of Western U.S. Cities & Towns, 1850-1990. Lanham: Scarecrow, 1996, 4. ↑ "American Factfinder" (CSV). United States Census Bureau. 2009-03-18. Retrieved 2011-07-07. ↑ Huisman, Jan (November 28, 2008). "Navy SEALs Find Ideal Training Grounds In Kodiak". Fairbanks Daily News-Miner. Retrieved 2008-11-30. United States Navy, Naval Special Warfare Public Affairs (March 21, 2007). "Cold Warfare: Future SEALs Get a Firsthand Lesson in Northern Exposure" (U.S. Navy press release). GlobalSecurity.org. Retrieved 2008-11-30. ↑ O'Leary, Joseph (Jul 5, 2012). "Contest may send rapper Pitbull to Alaska Walmart". Reuters. Retrieved 7 July 2012. ↑ "Walmart: Rap star Pitbull to appear in Kodiak". Anchorage Daily News. Jul 21, 2012. Retrieved 22 July 2012. 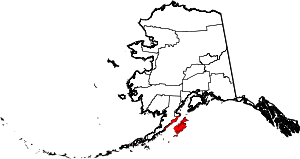 ↑ "Pitbull performs in Kodiak". New York Daily News. Jul 31, 2012. Retrieved 4 August 2012. ↑ "The Weather Channel Greenlights New Series "Coast Guard Alaska"". The Futon Critic. Retrieved March 18, 2015. 1 2 3 "Alaskans Are So Happy About The Škoda Kodiaq That They Renamed Their City For It". JALOPNIK. Retrieved May 10, 2016. ↑ "Let's All study Alutiiq!" (PDF). Alutiiq Museum. Retrieved May 10, 2016.